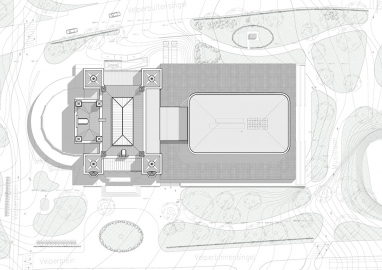 The project involves the renovation of a monument and a new extension in a city-park context. 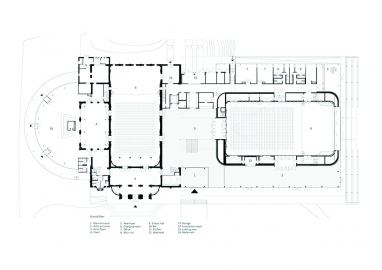 The multi-functionality and acoustics of the performance spaces, enabling the Musis Sacrum to be a home for a wide range of shows and events, from symphony concerts to pop gigs and everything in between. The project consists of a redesign of the existing park, a renovation of the existing monument and a new extension with a long-term planning in mind. 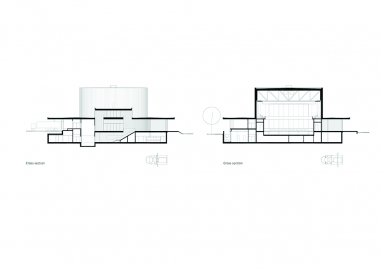 The extension features a large concert hall and supportive functions. 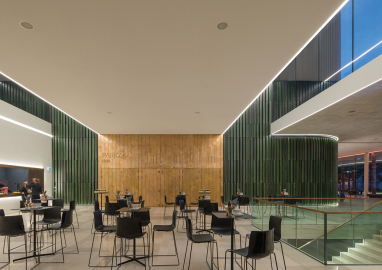 The design draws its origin to the core of the institution that defines Musis Sacrum: to perform and listen to music in excellent acoustical conditions within an attractive green context. The inspiration of the design reflects clearly the character of the Park, the Musis Sacrum Institute and the identity of the Gelders Philharmonic Orchestra and its concert hall. 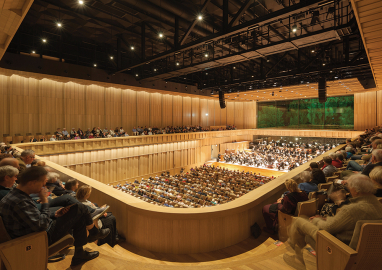 No concessions are made regarding multi-functionality and acoustics, enabling the Musis Sacrum institute to expand their operations to wide range of performances & exposure. 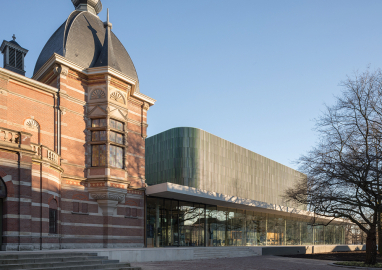 The user of the building, Musis & Stadstheater, is the main facilitator of a cultural program of music and theater performances in the area of Arnhem and its surroundings. 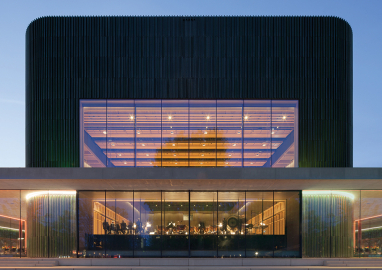 Aim for the Musis building is to facilitate all music-related events and to create a home for ‘Het Gelders Orkest’, one of the leading classical orchestra's in the Netherlands. 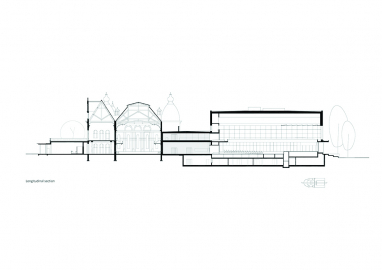 Since 1847 the concert halls of Musis Sacrum and its extensions had taken on a range of different forms and positions in the park that reflected the short time needs of its operators, city officials and residents. Unlike its former extension the new multi-purpose hall is positioned as a separate volume in the park, and is designed as an inviting and transparent pavilion respectfully complementing the historic building in its beautiful surroundings. 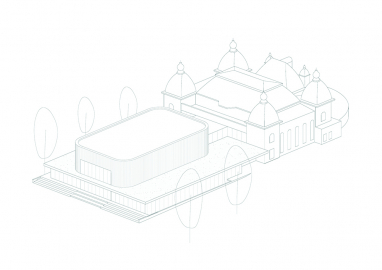 The new large concert hall features a large glass window behind its stage that opens up to the park and acts as a botanical backdrop and can also be opened for outdoor performances. Because of this unique feature Musis can now create open air public events in the park. This created a new public domain in Arnhem and make optimal use of this wonderful park in the heart of the city. 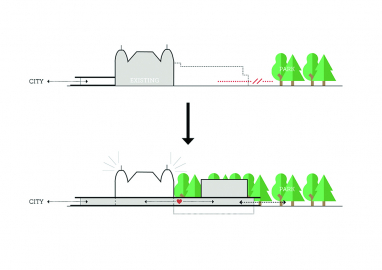 Besides redesigning the park the intervention of our design is divided in 2 parts. First part involved the new extension. For this we demolished all post-war additions to create a large, efficient & multifunctional machine to facilitate all music related events. Most of this large building is placed underground to make the impact in the park, together with the extensive use of ultra-clear glass, as minimal as possible. 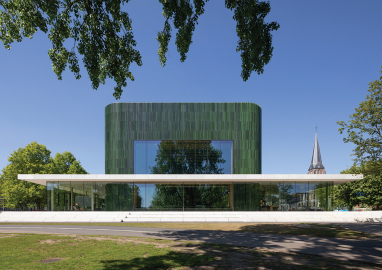 With its vegetated roof and nature toned ceramic facade it blends in with its surroundings. Second part consisted of restoring the old monument and making it up to date to current fire-, sound & safety standards. This with a clear aim in mind to revive the monument in its original glory and hide all technical necessities from sight. So most of the budget for this operation is not visible: ceilings, sprinklers and radiators are removed, cracks in the walls repaired, original wooden floors restored and rebuild the original east-facade from a drawing of 1888. Also the original arches & ceiling ornamentation are now continuing throughout the concert hall and brings back the former glory of this well-known music-arena with its much respected acoustical quality. 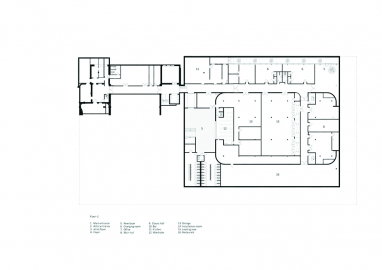 ﻿﻿van Dongen – Koschuch Architects and Planners.